All to often pet rabbits are lost or put to sleep because of a condition referred to most commonly as Wry Neck. If your rabbit exhibits the symptoms listed below, RUN, don't walk, to your nearest rabbit vet! It is an immune disorder caused by a tremendously opportunistic protozoa (microsporidia) that resides primarily in the kidneys in many (if not all rabbits) and when the immune system is compromised the parasite replicates ( by injecting spores through a polar filament into the host cells) and begins to migrate from the kidney through the blood stream to any organ in the body but most commonly the brain where it develops cysts on the brain. Another common depository is the eye which results in a chronic weepy eye. I believe that the location of the cysts on the brain causes a variety of symptoms and the severity thereof. During the last twenty years as a rabbit breeder I have seen a great variety of ailments, injuries and mysteries appear throughout my herd and those of friends but the most challenging and perplexing certainly must be Wry neck. I am not a vet and offer this information based on my experience of 25 years. Here is what I have found and the conclusions I have reached through research and necropsy. I believe E.cuniculi is far more common in rabbit herds than commonly accepted and is the most common cause of "Wry Neck" and other symptoms. I know that is manageable and treatable contrary to the opinion of many animal health professionals. I only wish I knew for certain where and how it begins. I suspect, but cannot confirm that rabbits contract the parasite in hay which is infected by rodents or birds in the hay fields or from other livestock that were previously pastured there. I doubt that it is acquired in pelleted feed since most of it is subjected to heat in the processing which would limit the possibility of the parasite surviving from alfalfa field to pellet. Another recent conclusion is that there is quite often a relationship to dehydration. Many cases I hear of follow a incidence of failed water bottle or changing to or from an automatic system to bottles. One study indicated that it was easier to replicate the spores in the laboratory by dehydrating the cells and thus the dehydration seems to make the cell more readily invaded. According to The Merck Veterinary Manual "Encephalitozoon (Nosema) cuniculi is a widespread protozoal infection of rabbits and occasionally of mice, guinea pigs, rats and dogs. Usually, no clinical signs are produced.....is believed to be spread via urine or transplancentally." I find this to be true. For many years most breeders, myself included, and vets assumed that a rabbit with Wry neck, (torticollis) was suffering from an inner ear infection brought on by stress or more commonly I thought, a draft. 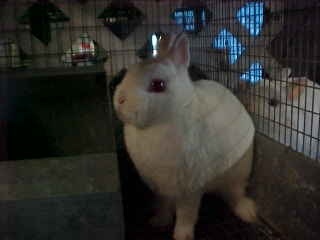 I have, in fact, had rabbits with the tilted head that did indeed have inflamed ear canals or fully involved with pus. 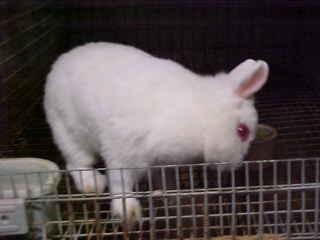 Upon rupture and drainage with the assistance of injectible antibiotics, the condition remedied itself and the rabbit returned to normal. That is, in my experience, the exception. I believe E.Cuniculi is responsible for a great many rabbits that "just fade away" and never result in Wry Neck as such. I believe it is the cause of kits in the nest box that are "faders". It generally presents symptoms 7 days after stress of dehydration, illness or abrupt weather change. It does not appear to be contagious among healthy animals although some studies indicate the spores can live outside the body for up to 30 days. I have never seen more than one kit in a litter with symptoms. Upon close evaluation of each case, there was some predisposing factor that compromised the immune system. "Wry neck" is the consequence of some other disability. This begs the argument of which came first, but I believe the immune disability is first followed by E.C. We see more cases in winter, during a molt, after kindling, in kits just being weaned by the Mother, in dehydrated animals and in very old rabbits. The first case I attempted to treat with the help of my local vet was a 12 week old male Netherland Dwarf. We began experimenting with a number of antibiotics but finally finding the best results with an antibiotic called Baytril. We gave 1/4 cc. twice daily for 10 weeks! Remarkably, the bunny survived without residual effects and went on to sire many offspring, who never exhibited any signs of wry neck. I no longer give antibiotics unless there is an active infectious process involved such as respiratory infection or purulent weepy eye. Over the years and many rabbits later I discovered that if I introduced a single dose of steroid at the rate of 1/4cc per 5 pounds of body weight I found much quicker recovery. I also began to notice a pattern in how the condition changed. If treatment was not initiated until the head tilt was obvious and Depo-Medrol was given we saw improvement on the second day and a marked regression on the third day. Days 4 through 7 were generally static with improvement beginning about day 8. Full recovery varies from 10 days to 3 months. We now realize the improvement is related to the second dose of Ivomec. The problem with Baytril was that while the rabbits didn't get diarrhea, they went off feed and became very difficult to recondition. I then began to use less Baytril and found the Depo-Medrol produced the same results but actually stimulated the appetite which led to a quicker recovery. Steroids are not necessary unless the disease has reached the point of uncontrollable rolling. I then replaced the Baytril all together with another type of antibiotic, Penicillin with Benzathine (aka Pen BP 48 or Dura-Pen) or Biomycin sub-cutaneously. It produced no overgrowth of bacteria in the gut and no loss of appetite. I now ONLY use Antibiotics if the predisposing factor was infectious in nature rather than obvious stress of kindling or dehydrations etc. Once I put all this together and had successfully treated a number of "hopeless" cases, I found a new wrinkle. If the wry neck victim didn't show nystygmus (darting eye) , I couldn't save them! I read an article in Domestic Rabbits by Dr. Wendy Feaga explaining her experiences with wry neck and her findings of a protozoa in the kidney and its migration to the brain. It sounded to me somehow akin to coccidiosis and decided to try a cocci treatment on the next case I came across. A local breeder brought me a 6 weeks old male dwarf that someone had left on his door step and asked if I wanted to try to save it. When I saw no darting eye I had little hope but decided to try sulfa. Not having Sul-met or similar on hand, I settled for copper sulfate in the water, gave him 1/8 cc. Depo-Medrol and let it go at that. A day or two wasn't going to make a big difference with this little guy. To my surprise he was moving better the next day and in a week was left without any symptoms! In later cases the addition of Sul-Met made little or no difference but the copper sulfate seemed to help. (Perhaps a nutritional deficiency?) Due to the dangers of too much copper sulfate I have only used it as a last resort. Perhaps a copper deficiency in the diet was the original stressor. A couple of years ago I began to have an assortment of ailments pop up throughout the barn. 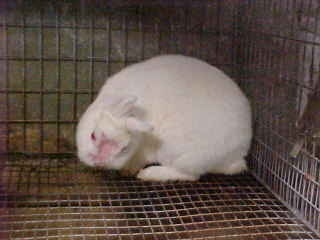 Rabbits with colds, some "going light", losing weight, listless etc. We sent specimens in for necropsy and discovered Pseudomonas as the culprit in all but one dwarf. But the greater mystery was that they found nothing in the dwarf but incredible emaciation. No evidence of Pseudomonas, cocci, Pasturella, Bordatella, intestinal parasites, nothing!. The dwarf had not been on the automatic watering system. I insisted that they had overlooked something and asked them to go over the dwarf again and the mother as well. Upon re-examination they found E.Cuniculi cysts on the brains of both. Once the E. Cuniculi had been diagnosed, I was on a campaign to find a cure. I searched the internet and all readily available veterinary references for anything I could find on E.C. and found an article that indicated Albendizole ( the human equivalent of Ivermectin) is used to treat Aids patients infected with the Encephalitazoon protozoa. Many vets are now using Oxybendazol with great success. I am convinced, based on my own experience, that Ivomec( (a cattle wormer) is the key to stopping the migration and replication of the parasite. Ivomec 1% injectable solution for cattle (given orally or by injection) paralyzes the parasite and stops the migration to the brain or other organs. Ivomec is safe and does not cause loss of appetite or other side effects that I have seen other than some minor lethargy for a couple of days after the first dose. Checking health records for the rabbits with Wry neck I found that in every case they had either never been treated with Ivomec or had not been treated in 6 months. (I usually treat them at three month intervals). I finally came to the conclusion that in order to fight E.cuniculi I needed to kill off anything else that could possibly compromise the rabbits' health. And I now suspect that everything we do simply makes it possible for the rabbits natural defenses to develop an immunity to the EC. Any rabbit exhibiting symptoms now are treated with not only Ivomec but Piperazine as well. That is followed with antibiotics if there is infection present and Depo-Medrol if rolling has begun. I do not intend to prescribe any medication, only to report what works for me. I find a dosage of one-tenth cc. per pound of body weight seems most effective for all injectibles as well as Ivomec by mouth. Piperazine is given at the rate of 4 drops per pound. Piperazine is a pin worm medicine and has no direct effect on E.C. but may help eliminate pin worms that can further debilitate the rabbit. It is not, however, critical to the treatment of E.C. Many, I'm sure will disagree with the dosage but it works for me. I have found the lower dose of Ivomec is ineffective. The action of the Ivomec appears to be that it immobilizes the e.c. and prevents it's multiplication and migration to the brain. Supportively they are removed from any source of draft or extreme heat, loud noises or other stress factors. Bene-Bac or other lactobacillus, and Nutri-Cal are added to maintain gut stability. Providing water at a level they can access easily can present a challenge but it is imperative to reduce dehydration. Feeding alfalfa hay, carrot tops or parsley drenched in water, bananas, apples etc. make eating in an upside down position easier for them. It may not be according to Hoyle, but in the last 12 years I have treated well over 100 rabbits with what I believe is E.Cuniculi (some without necropsy or blood tests so I can't be certain of the exact number of confirmed cases) and I have only failed to be successful in 4 cases. The suspect cases that were necropsied confirmed my theory. Perhaps it's just luck or perseverence, but it has saved animals "everyone said couldn't be saved". I had not used the Elisa titre since I understood that it will only show IF a rabbit has EVER been exposed and not whether it is an active case of e.c. And since the titre simply shows an immune response to e.c. I'm not convinced that a positive titre is a bad thing. I have a doe with a perfectly healthy litter who has tested positive and I believe as long as she is well nourished it will never become a problem. I do, however continue to monitor her offspring. Testing the urine for presence of spores seems a more efficient method since the ELISA only detects the spores once injected into the blood stream. I recently read an article from Oklahoma State on spore germination which explains that if cells were dehydrated it was easier for the polar filament to inject the cell and when the cell was rehydrated the spores germinated rapidly. That may explain why we see more cases of e.c. in the winter when rabbits require more fluids. Looking back at cases of e.c. I found several who had been moved from a crock or automatic watering system to a water bottle and didn't know how to drink from a bottle. I hope my experiences will provide owners and their vets with some hope and an arsenal to fight this terrible disorder or better yet, further research to find how, when and where the protozoa is acquired. Maybe then, we can prevent it rather than face the challenge of the cure. I am convinced, based on my own experience, that Ivomec (a cattle wormer) is the key to stopping the migration of the parasite. Ivomec 1% injectable solution for cattle (given orally) paralyzes the parasite and stops the migration to the brain. Ivomec 1% injectable solution for cattle given orally at the rate of 1/10cc per pound of body weight. Dosage repeated in 7 days. Then followed at 3 month intervals as a preventative. It is critical that the dose be repeated in 7 days at that appears to be the life cycle of the spore. We generally see improvement in the condition after the second dose of Ivomec. Piperazine (pin worm medication) at the rate of 4 drops per pound given orally at the same time as the Ivomec. Repeat in 3 month intervals. This is to remove additional parasites that might compromise the immune system but does not effect the EC spores. Steroid injection (Depo-Medrol, Cortisone or similar) at the outset in a single dose of 1/4cc per 5 pounds of body weight. This is only in cases of rabbits who are rolling. Repeated doses may compromise the immune system. Antibiotic therapy to treat an obvious infectious condition that is suspected of being the original stressor. My drug of choice is Penicillin with Benzathene or Biomycin administered sub-cutaneously at the rate of 1/10 cc. per pound of body weight. This dosage is given every 48 hours for 3 days ONLY. Probiotics are given if antibiotics are used. THIS IS ONLY WHAT WORKS FOR ME AND IS OFFERED AS A GUIDELINE FOR YOU TO DISCUSS WITH YOUR VET AND USE UNDER THEIR SUPERVISION. Keep food and water securely fastened and down low to assure easy access. A good appetite is imperative to recovery. We offer alfalfa hay which is easy to eat from a tilted position. Carrot tops or parsley drenched in water are an easy source of liquid and seems to be well tolerated. We also offer banana slices, apples etc. since they are easy to eat as well as nourishing. Grocery stores often sell wheat grass in little tubs and I put the entire contents of the plastic tub in the cage on it's side. The rabbit will eat the grass easily and then will eat all the roots, dirt and all! They love it and it seems to help. Syringe feeding may be necessary but can add additional stress so we only recommend it in cases that simply refuse nourishment otherwise. Nutri-Cal is a paste type of high calorie supplement that can be fed or even wiped on the front feet. The rabbit will lick it off the feet. Sticking front feet into pureed feed like Oxbow's "Critical Care" or Barbi Brown's "Magic" will also get some high powered nourishment in a sick bunny. Fluids of any kind are VERY IMPORTANT. If the rabbit refuses to drink the vet may need to administer sub-cutaneous fluids to keep them hydrated. Fragrant liquids like apple juice, creme soda, fruit flavored teas are good ways to coax more fluid intake. Bene-Bac or other probiotics are required if using antibiotics. The cage, feeders, watering supply must be regularly disinfected with 10% bleach solution (rinsed well). NO OTHER DISINFECTANT WILL KILL THE SPORES. Spores can live outside the body for months if left untreated and will result in reinfection. Remove anything from the cage that they can urinate on. Resting boards, towels, carpets, sheetrock, nest box etc. and disinfect them. If the urine is on anything they sit on they will reinfect themselves while grooming. For rabbits who have started to roll, you can put them in a carrier and roll towels around the side to prevent injury but be sure to launder them daily in bleach solution. Gentle massage of the neck and back can offer some relief from the torqued position. Some rabbits will find it helpful but some will be more stressed by it. Use your best judgment here. I have one reader who actually took her rabbit to a Chiropractor and got adjustments to her spine. She said it really helped. In cases of hind quarter paralysis I find exercise on the grass is helpful in regaining muscle tone. For rabbits in great distress I find a warm bath often helps to relax them. I fill the tub or sink with very warm water a let the rabbit float in it with the head cradled in my hand. A gentle massage over the back and neck seem to help reduce stress. But a bath is best done with two people in case the rabbit begins to roll. Since the posting of this page I have received many letters telling of success in treating Wry Neck using my methods. I hope to be able to provide a list of the veterinarians that have treated this disease successfully as a resource for vets seeing this disease for the first time. Many rabbit savvy vets are now using Albendazole and Fenbendazole (Panacur) to treat Wry neck with excellent success. The difference in the bendazoles and Ivomec is that Ivomec remains in the sytem longer and the bendazoles are elimated more quickly so must be administered daily for up to four months and some vets recommend continuing it for life. Regular blood work is required as well to monitor possible liver damage. The Ivomec appears to work quickly with maintenance dose every 3 months. There seems to be some evidence however that Albendazole actually reduces the cysts whereas Ivomec seems to just stop the migration and multiplication. I have about 80% recovery with Ivomec but have added the Albendazole treatment for stubborn cases and have only had a couple respond and it took 4 months. There are many articles now on the Internet about e.c. and the conclusions are varied. Many of the conclusions are based on a small number of animals studied. I would like to see more research on this subject using a larger study group from various herds to confirm or preclude a number of conflicting conclusions. I encourage anyone who has experienced these symptoms to contact me. The more we learn from each other, the more precious bunnies will be saved.